The worldwide staff at Needtovent.com is pleased to announce the winner of the inaugural SCHIAVO AWARD for the most pathetic, lifeless and brain dead movie of the past twelve months. The hermetically sealed envelope was delivered earlier in the day by a representative of the prestigious accounting firm of Ernst & Whinney. (Yes, Whinney the Pooh actually helped oversee the tabulations given the immense importance of this award). The results were unprecedented, with THE WEATHER MAN winning the SCHIAVO AWARD in a veritable landslide over runner-up THE DUKES OF HAZZARD. 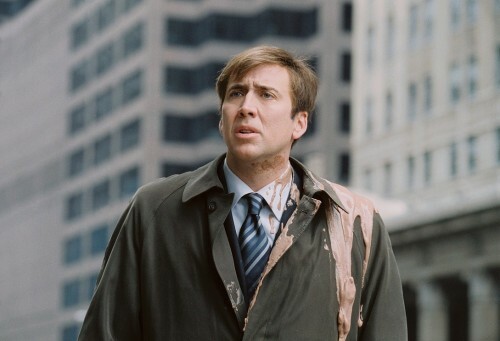 If you are among the lucky ones to have not seen THE WEATHER MAN and thus have not had to reach for a bottle of Pepto Abysmal (a necessary elixir for anyone who has the stomach to actually try and watch this cinematic calamity), the film stars Nicolas Cage as a self-centered, insecure yet oddly narcissistic weatherman who has a troublesome relationship with his father, with his wife, with his two kids and an even more troubling relationship with himself. Michael Caine plays the father in what is surely his most embarrassing screen appearance ever. Perhaps he somehow wandered onto the wrong set -- that's as good an explanation as any to why Mr. Caine would agree to participate in this fiasco.